(Above) The 500-seat Allen Theatre at Playhouse Square. (Left) The Aviom Pro 64 System is the center of the theater’s audio network. CLEVELAND, OH—When “The Life of Galileo” opened in the newly revamped, 500-seat Allen Theatre at PlayhouseSquare, Aviom’s AllFrame Multi-Modular I/O System, part of the theater’s Pro64 Audio Network, was waiting in the wings, ready to make its debut during the inaugural season of Cleveland Play House (CPH)’s new theater. “Due to the historic nature of the Allen Theatre, the recent transformation entailed building a shell inside the existing building, while still maintaining the original architecture,” said Raymond Kent, CTS LEED AP director of Westlake Reed Leskosky (WRL)’s Innovative Technology Design Group, an associate principal with WRL, and the lead AV systems designer for the project. When it came to redesigning the audio system within the Allen Theatre, Kent selected the Pro64 Audio Network and the AllFrame Multi-Modular I/O System from Aviom in particular because of the advantages it offered over a traditional analog system, as well as other digital audio networks. The Aviom Pro64 system is the center of the theater’s audio network, connecting the DiGiCo SD9 digital console in the control booth to locations around the theater. An Allen and Heath GL2200 console does the same for the lab theater. 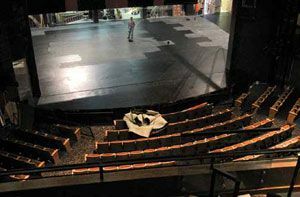 Throughout the theater, there are currently three AllFrames installed at specific points, including the orchestra pit and stage, and two that can be placed anywhere that they are needed for a particular production. In addition, there are several locations throughout the theater where Pro64 Cat-6 inputs are installed. These run to Pro64 MH10 merger hubs to provide more connection points for the loose AllFrames. Those that are installed are located at upstage right, upstage left, and in the mix pit. A Cat-6 cable connects each AllFrame to the front-ofhouse console, and input/output connections can be selected from the different locations as needed. The audio system also integrates several Crown and QSC amplifiers between the second stage area and the lab theater, as well as Biamp paging systems. The Allen Theatre’s network consists of six F6 Modular I/O Frames, multi-purpose network frames with six field-configurable I/O card slots and integrated Cat-5e (or Cat-6) and fiber optic connectivity. The F6s can be powered through a four-pin XLR connector, a Euroblock connector, or one of the Cat-5e A-Net ports. In each F6, there are up to six AllFrame modules installed. Most of the units are designed as 16x8 with four C4m mic/line input cards and two C4o output cards. But the number of each card and the type can be changed in each of the F6s to configure the system differently for different productions as needed. This flexibility gives the theater the ability to design the best possible system for a given production with ease. In addition to the Aviom AllFrames, the theater has Pro64 rack-mounted I/O components, including a number of 6416i input modules, as well as several 6416o v.2 output modules and 6416dio digital I/O modules. They also have an RCI remote control interface and MCS mic control surface combination in use at the console to remotely control the mic pres in the system. Various Extron units distribute video.